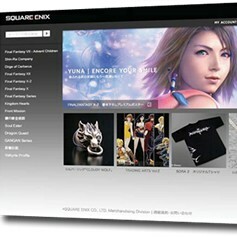 Square-Enix needed an Interactive firm that understood the US, European and Asian markets, along with all the technical constraints involved in global commerce, to build an Ecommerce store selling accessory items for its Final Fantasy, Dragon Quest and Kingdom Hearts brands. Square-Enix is a video game company best known for its console role-playing game franchises, notably the Final Fantasy series, which is the fourth highest selling video game franchise of all time, having sold over 68 million units worldwide as of May 2006. #10 was responsible for creating the information architecture, look and feel, backend and front-end coding of the site. Since the site was to be created in multiple languages (English, Japanese, French, German, Spanish and Italian), the architecture, design and coding needed to support a multilingual environment. #10 also built numerous custom features on the backend, which allowed Square Enix to integrate customer, product and order data seamlessly with their logistics platform and fulfillment centers.